Flavors of the season that you don’t want to miss. There is just something about pumpkin and entering the fall season that is so, so endearing and delicious. Whether it’s a layered Pumpkin Pie with chocolate, Pumpkin Muffins, or a delicious Pumpkin Shake. 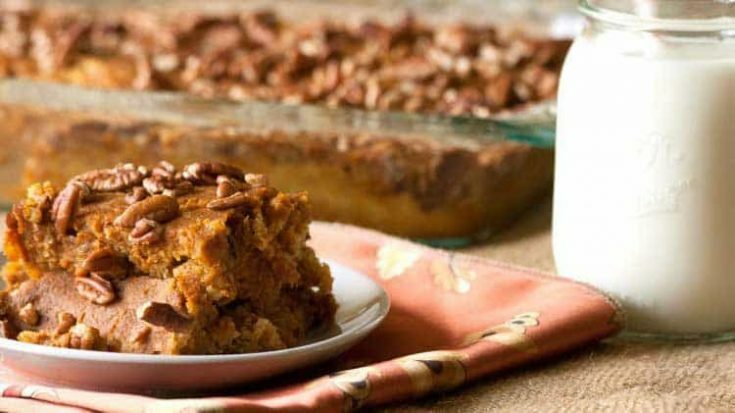 Now–this Pumpkin Dump Cake Recipe is amazing. It’s light and moist, sweet without being overly so, and who can complain about adding veggies into a dessert, right? Pumpkin is a fall flavor, but its one that I like to cook with year round. We have so many pumpkin recipes here on All She Cooks, and I’m sure we will keep adding to that list since it is one of our favorite veggies to bake with. There is no shortage of pumpkin around these parts. My kids and hubby can’t resist a tall glass of milk with their sweets. Me, I’ll take my piece of Pumpkin Dump Cake solo. Or, maybe with hot cocoa. I love the concept of a dump cake, don’t you? Mix together some ingredients and dump a cake mix on top of it and let it bake. Technically, you’re not supposed to stir the cake mix into the rest of the ingredients, but you know what? I totally rebelled on this one. Call me liberated, but I decided that this Pumpkin Dump Cake Recipe would flow so much better if the cake mix was lightly mixed in instead of just dumped on top. And–as you can see from the photos, it turned out fabulous! I love it when I’m right. I’m not a professional food photographer by any means, but I’ve learned several tips over the last couple of years that have lent to improved photo styling. One tip I particularly enjoy using is height. Whether its making a stack of cookies, putting a couple pieces of food on top of one another, or staging food–practice makes perfect. I think I’ll keep practicing. If you’re a pecan lover, you’re going to dig this treat–or dig right into it. I’d hold you back, but that would just be so I could cut in front of you and grab a piece of Pumpkin Dump Cake for myself. You know, when it comes to dessert, I’m the first in line. If you’re getting a jump start on pumpkin baking outside of the fall season, it can sometimes be difficult to find canned pumpkin in the stores. For that reason, I love stocking up on canned pumpkin on Amazon. If you’re feeling a tad bit indulgent, top our Pumpkin Dump Cake with a scoop of vanilla ice cream or whipped cream. It’s amazing flavor combination meant to savor! Grease and flour a 9x13 baking pan. Mix together pumpkin, sugar, eggs, milk and seasonings. Spread out in baking pan. Top with cake mix and lightly mix in. It does not have to well incorporated, just mixed enough so not all of the mix is on top. Pour melted butter over the top, and then sprinkle with chopped pecans. Bake for between 50-60 minutes. Wow this dish just looks beautiful and I am sure yummy! I LOVE Pumpkin! This recipe will have to be used this fall! Thank you for linking up with us at the Tips and Tricks Link Party! 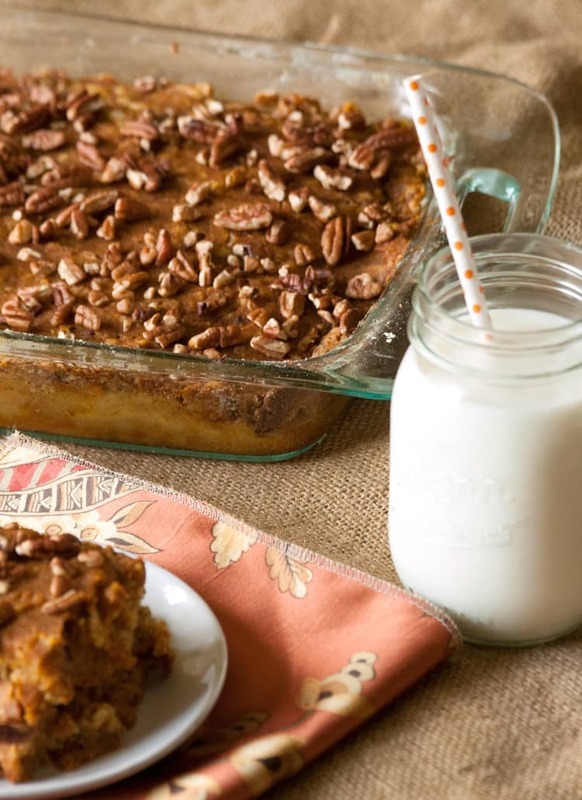 Pumpkin dump cake looks delicious, pinning and featuring on this week’s blog hop. Yum! Saving this for the fall season 🙂 Thanks for linking up with Thursday Favorite Things. Hope your weekend is amazing! This looks absolutely fabulous! I’m so ready for cool weather, pumpkins, and FOOTBALL! Oh my goodness this pumpkin cake sounds so yummy!! Had this cake at a church dinner Thursday. It was melt in your mouth good! Went right home and bookmarked it. This will be on my table for Thanksgiving, that’s for sure! So wonderful that it was a big success! I need to make this again soon myself.